I am great at making grand plans and coming up with fabulous ideas. But if I’m honest with myself, I struggle with follow-through. Can you relate? I knew when I purchased The Mystery of History supplemental downloads, I needed to take steps to make sure I used them well, or quite honestly, they might end up sitting in a folder on my desktop. I needed to create a history binder. I’ve already written extensively about the benefits of the downloads, how to store and use them, tips for teaching with them, etc. What is a history binder? 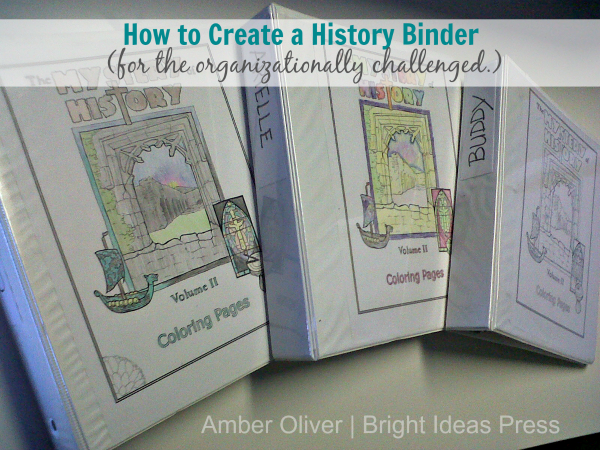 In its simplest form, a history binder is a three ring binder to file what you learned in your history lessons. The Mystery of History encourages you to make and keep one organized by continent/country. However, when I began using the downloads, I realized I needed a different set up. I spent an entire day printing each download I wanted to use for each of my three children. Then I hole punchednd arranged the printables in the binders. In the end, I had a binder full of blank notebooking pages, coloring pages, and review questions waiting to be filled in. Additionally, we can file extra pages that we do—maps that we print, projects that we do—right there with the accompanying lesson pages. How should I organize my history binder? I pondered this for several moments myself before deciding on a system. The kids each have slightly different notebooks because of age, but this is the basic set up. Then I repeat that order for the successive chapters. If you don’t print the pre-test and review page for the chapters beforehand, you can add them and other maps and activities as you encounter each lesson. We actually do the pretests orally, or looking at the page in the book together, so we don’t print those at all. Set the binder up to suit your needs and teaching style. Your printed downloads are going to require a rather large binder. The thick stack of papers inside could also make it a little difficult to use. Here are a few tips to making using the binder manageable. Invest in a three-inch binder that’s designed to close easily with a large stack of papers inside. 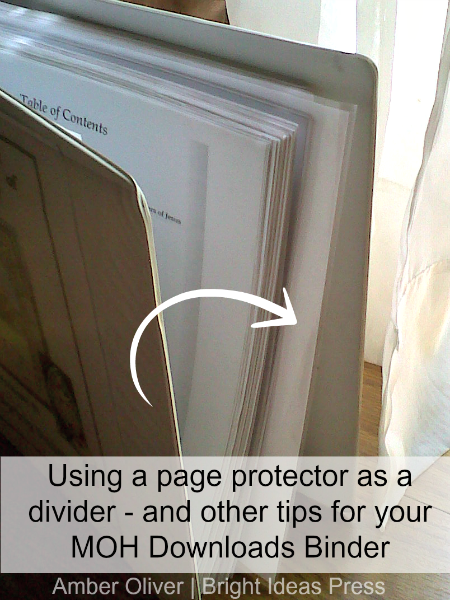 Use a sheet protector with a stiff piece of paper in it as a bookmark. Move the sheet protector to your current spot in the notebook as you work through it. Use dividers to separate the four quarters of the book. Keep hole reinforcement stickers handy. You’re bound to need them at some point! Why do all this? If you’re organizationally challenged, a day spent prepping and organizing can make a world of difference later. If you love to organize, well, you’ll love this project anyway. The best part about taking the time to organize the downloads into the binder is that they are ready and available to use when needed. Everything is together in one place with room for extra maps and writing assignments. At the end of the volume, we’ll have a great review of our year. I use my binding machine to do a lot of this, and it’s been a huge help for me.